Don’t fear! There’s always a way to get back on track. 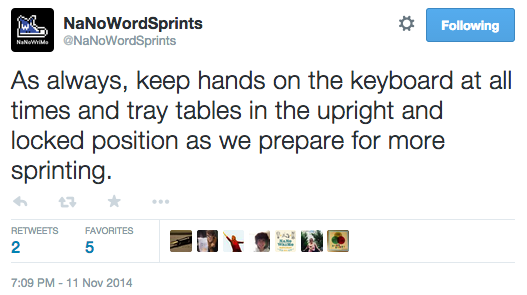 Two Twitter accounts that really help to keep you on tack are @NaNoWriMo and @NaNoWriMoSprints. 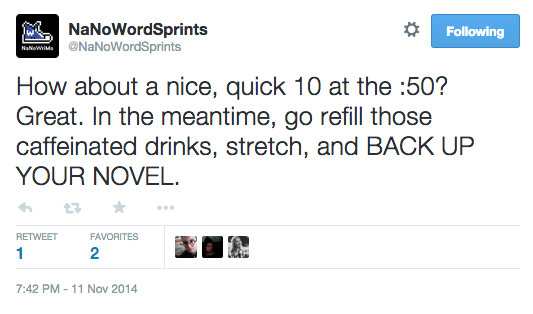 NaNoWriMo Sprints tweets out short challenges to keep you writing and to keep writer’s block from setting in. @NaNoWriMo is usually tweeting out encouraging words and updates on their fundraising goals and merchandise. Both good follows if you’re a NaNoWriMo writer!